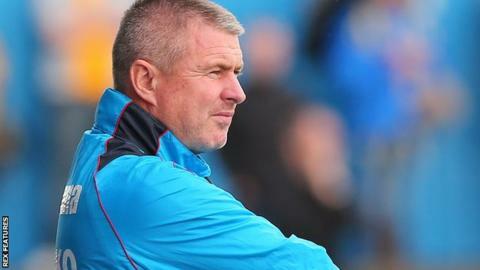 Micky Moore has left his position as manager of National League club Barrow after just eight weeks in the role. Moore took charge on an interim basis in August and signed a two-and-a-half-year deal on 20 September. However, Barrow took one point from their four league games after Moore's full-time appointment and they lost to seventh-tier side Shaw Lane in the FA Cup fourth qualifying round on Sunday. Assistant manager Neil Hornby will take caretaker charge of the team. Hornby only joined the club on 13 October as number two to Moore, who replaced Paul Cox as Barrow boss earlier this season. Barrow are 20th in the National League. "We are all disappointed that it hasn't worked out," said chairman Paul Casson. "Micky inherited a difficult situation and he gave his all towards it."